Gastroesophageal reflux disease (GERD) is a chronic condition that more than 40 percent of Americans suffer from. Acid is a completely normal feature within your stomach, aiding in the digestion of food. In some cases, acids and bile will flow upward, or reflux, into your esophagus. This causes pain, discomfort, and indigestion. Reflux is caused by a weakness in the lower esophageal sphincter (LES). 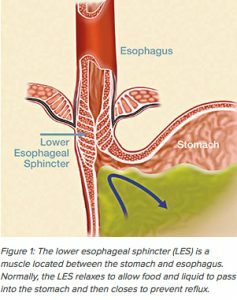 This muscle is at the junction of your esophagus and stomach, and it functions as a valve that lets liquids and food pass through to the stomach. 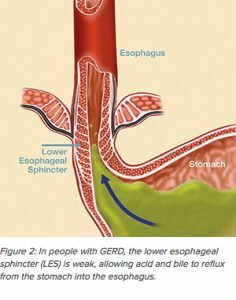 GERD is more common in obese people and pregnant women. Other factors that contribute are smoking, eating large meals or eating meals late at night (before going to bed), fatty or fried foods, alcohol or coffee, and certain medications like aspirin. To help treat GERD, diet modification should be explored. Other options include over-the-counter (OTC) antacid medication, prescription proton pump inhibitors (PPI) medications, or surgery if the condition persists. Southern Reflux Center can help. With more than two decades of reflux treatment experience, the center utilizes evidence-based reflux treatment methodologies, allowing for more accurate diagnosis and superior treatment plans focused on the root problems and not just the symptoms. For more information or to schedule an appointment, contact Southern Reflux Center by phone or online today.